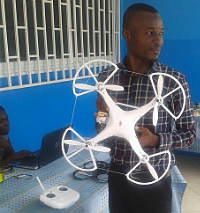 Application of drones for development is a new area in Ghana, however it is rapidly evolving with significant potential to aid Ghana’s development agenda in the area of health, agriculture, security, road safety and traffic management; natural resource management, aerial photography, 3-D mapping; search and rescue, among others. This was the outcome of the Technology Salon Accra on the topic “How Can Drones Accelerate Ghana’s Development?” The 2 hour exciting thought provoking discussion covered; the business of drones, use cases of drones application in Ghana, risks and challenges, privacy issues, local research and development of drones, education and training; and policy options, regulations, licensing and laws that should guide the rapid uptake of drones in Ghana. Drones, also referred to as Unmanned Aircraft System (UAS), Unmanned Aerial Vehicle (UAV), or a Remotely Piloted Aircraft (RPA), have over time seen a lot of applications in development due to improvements in technology and lowering costs. 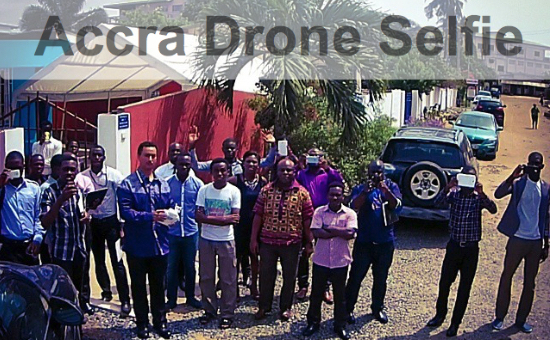 Technology Salon Accra dove into drones with 30 technology enthusiasts. Sign up now to attend the next Salon. David Bolton posited that there is an endless list of opportunity that Ghana and the developing world can take advantage of the usefulness of Drones and its application. To him, it is all about research and whether or not there is the political will to back drones development and also regulations should be developed such that it does not stifle innovations on the application of drone technology for national development. “Drones application have provided a way of providing relief in project areas that are very hard to reach, for instance development partners sometimes find it difficult in reach some portions of rural Ghana, and drone technology provides the opportunity for them to circumvent that challenges of reaching remote parts with medical supplies or relief items” Kafui Prebbie of Techaide, a participant at the event. Excited about the discussions, Edward Ayo from the International Fertilizer Development Center believes Drones could very well help cut down the cost in research and field investigations. Drones can play useful roles in taking aerial pictures, mapping for irrigation purposes and also monitoring activities on large scale farms while minimizing the cost of walking the fields or hiring an airplane for same purpose,” he said. 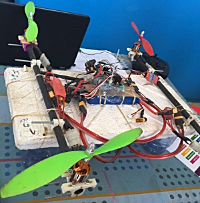 There was a demonstration session, which had on display different types of Drones including a locally manufactured type built by a Ghanaian. Participants got a first-hand experience and took practical lessons on Drones and how they work during the session when they took flight to take aerial pictures of Osu. “How Can Drones Accelerate Ghana’s Development?” hosted by Penplusbytes has no doubt set into motion thought provoking elements on potential challenges and advantages of drone technology for accelerated development, while suggesting practical ways and strategies to ensure Ghana does not only use drones to accelerate its development but also becoming a global leader and innovator in this area. Participants formed the Drones for Development listserv to sustain the discussion, exchange information and knowledge, network and stimulate uptake of drones for development in Ghana.